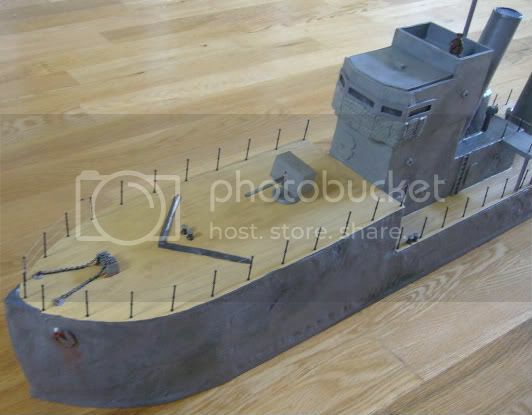 My only post this month, but perhaps understandable, given the size of the project in question - a scratchbuilt RN Destroyer, for use with my pulp/VBCW games. I should probably state for the record, that I started this on a whim, and had no idea how i'd use (or even store) it - like so many of my ideas, little or no planning was involved. 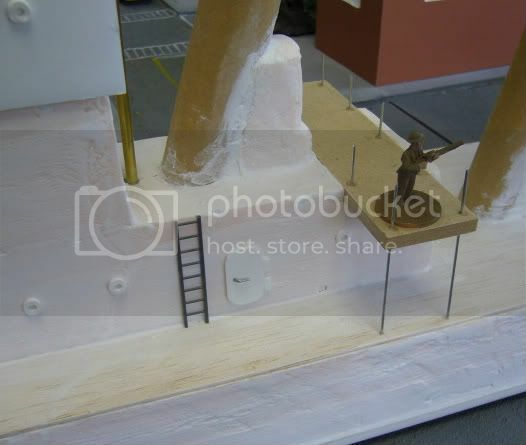 The base is made from 6mm MDF, with the layers built up of high density polysterene, available from most DIY stores. The polysterene has been coated with a polyfiller/UPVA glue mix to esal it, then sanded down - I decided to retain some of the rough scars, on the hull, as it is supposed to be a battered old WW1 Destroyer, on the verge of being scrapped, which is suddenly hurried back into service in 1938. 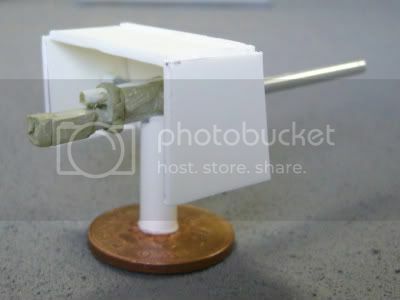 As you will see from the 28mm GWM figure on the bow, it is a tad large - just a smidge under 4 feet long! The decking is a thin balsa wood - extra surface details were added with plasticard, and milliput. 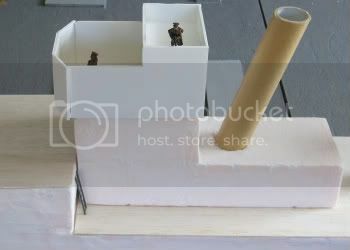 The superstructure has been built up, again using more polysterene, with the bridge made of plasticard. 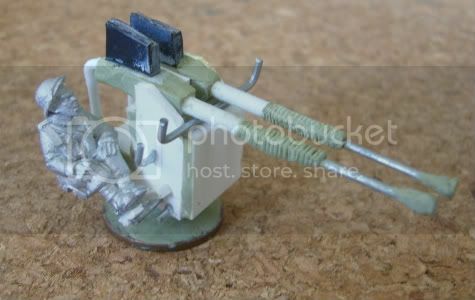 The weaponry has been scratchbuilt - the vessel is loosely based upon an Admiralty S Class destroyer, with two 4" guns (should have had three, but one was removed in the breakers yard) 4 torpedo tubes, and an anti-aircraft gun. The latter is another piece of artistic license on my part - the standard weapons would have been heavy vickers, or Pom-Pom guns, but this vessel has a state of the art twin 40mm bofors (added by its new captain). 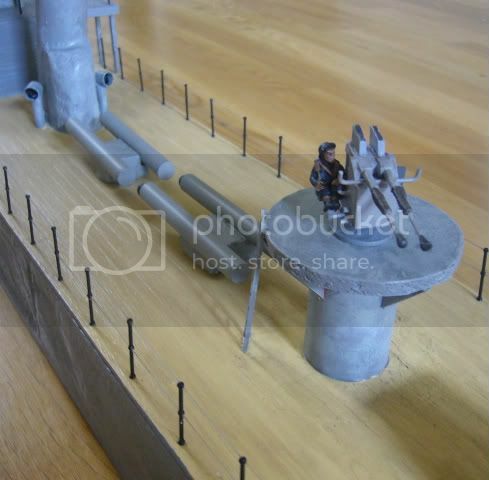 I also added a gantry, made from 6mm MDF, and funnels, made from coardboard tube, with more polysterene. The whole model was then painted with acrylic paint (tester pots from a local DIY store), and the deck given a GW devlan mud wash. After painting, I scored the balsa wood deck to give the impression of planks, before sealing the model in a couple of coats of spray varnish. The final job was to add the stanchions (cheated on this bit, as I used prefabricated ones from Robbe), and then threaded them with grey cotton.